Dr. Sunil V. Joshi practices in Panchakarma therapy. He gives lectures on Ayurveda throughout the U.S. He is the Ayurvedic consultant to The Chopra Center for Well Being. This text combines insights and information about Ayurveda as well as about the theory and practice of Panchakarma. "This book will help answer many of the questions that Westerners often askabout Ayurveda" - Professor Kenneth Zysk, Ph.D. Ayurveda and Panchakarma is the study of Ayurvedic purification. The author, Dr. Sunil V. Joshi, began his clinical practice in 1981 in India, specializing in Panchakarma therapy. Since 1989, Dr. Joshi has traveled extensively throughout the U.S. giving lectures and teaching workshops on Ayurveda. A "Treasurehouse of wisdom isaccessible to more people through this wonderful book." - Dr. Deepak Chopra, M.D. This book is truly something rare. It captures Ayurvedas true jewel which is Panchakarma at its very core and presents it in a very simple and powerful way. Dr. Joshi and the co-writers take you into the inner wisdom of Ayurveda which you will see is a medical system that is deeply intuitive and has an understanding of disease that is unequaled. 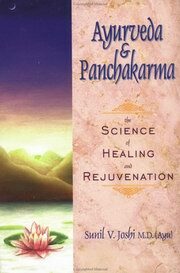 Dr. Joshi is a rare treasure of clinical wisdom too, he presents a number of case examples in the book that show how Panchakarma can bring a dramatic healing in many chronic cases. Ive carried a copy around whenever I do Panchakarma myself as a reference to the treatments, their indications and conta-indications. It also elaborately covers the basic principals of Ayurvedic science so beautifully. I highly reccomend this for all Ayurvedic students and even doctors who are qualified who want to see a simple but perfectly balanced presentation of Charakas Siddhisthana which is the ancient text that presents Panchakarma treatments. People often forget that Ayurvedas main treatment for disease is indeed Panchakarma, herbs, diet and lifestyle are part of daily regimen for maintaining and preventing disease, but once the disease has ripened, Panchakarma is the quickest and most effective way to remove the disease. But it must be in the hands of someone who truly knows this science in its inner wisdom. Dr. Joshi is a very rare example of this person. He also runs a beautiful clinic in Nagpur which is often booked months ahead with people from India and abroad seeking healing treatments under his supervision.